David V.G. Brydon (1937 – 2012), was one of the founders of Brydon, Swearengen & England, P.C. 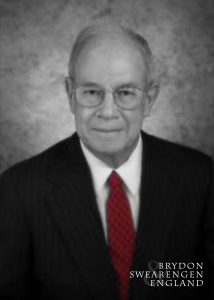 Born in Jefferson City, Mr. Brydon was a 1955 graduate of Jefferson City High School, where he served as class and student body president. He spent his undergraduate career at Westminster College in Fulton, Mo. and the University of Missouri – Columbia, graduating with a Bachelor’s in Political Science in 1959. Mr. Brydon then stayed at the University of Missouri to earn his law degree in 1963, which had been a lifelong goal. Mr. Brydon’s legal education was suspended while he served in the military as a First Lieutenant in the United States Army. He was on active duty in Aberdeen, Maryland before returning to Missouri to serve as Captain of the state National Guard. Immediately upon receiving his legal license, Mr. Brydon went into private practice. In fact, from the time the law firm was founded until his retirement in 2008, Mr. Brydon never worked anywhere else. Brydon, Swearengen & England, P.C. eventually grew to have a staff of over 20 full-time employees. Mr. Brydon’s legal career was vast and varied, and he was named an AV Preeminent Peer Review Rated attorney, a testament to the respect he received from his peers in the legal field. In addition to his work at the practice, Mr. Brydon served as the Assistant Prosecuting Attorney for Cole County. He was even certified to practice law before the United States Supreme Court, receiving that certification on March 17, 2008. A lifelong member and Elder of the Presbyterian Church, Mr. Brydon’s hobbies included hunting and fly fishing, for which he traveled around the world. He was also an experienced pilot, having received his pilot’s license at 16 before flying throughout the United States as an adult.